A few weeks ago, I wrote an article about strategies for engaging your visitors. In it, I expanded on four different techniques to keep visitors to your website engaged and active. One of the strategies was using virtual rewards and status — also known as game mechanics (or funware) — to increase website engagement. Websites and applications like FourSquare, StackOverflow and Farmville all use game mechanics to attract and retain users. Even not-so-obvious websites like eBay and Yelp! have aspects of game mechanics baked in to the functionality. Game mechanics is a piece of the website engagement puzzle, providing an incentive to become an active participant when there is no direct, tangible benefit for doing so. Why Should You Care About Game Mechanics? Sounds like a gimmick, right? Kind of like the cheap toys they put in cereal boxes or the t-shirts that credit card companies give out to convince you to sign up for a new card. While it may seem that way at first glance, game mechanics have clear business benefits behind them and oftentimes generate a significant return on investment. People talk about things that are different and interesting. Game mechanics create something worth discussing and engaging with. FourSquare could have just chosen to be a location-based app to find your friends, instead the service introduced a competitive system of badges and status. Probably part of the reason they have been adding up to 10,000 users a day. Whenever there are points, rewards or status involved, people are going to pay attention. Sometimes it may seem silly, but providing simple incentives can go a long way towards creating an active environment. Like any game, it can also be addicting, providing users with an incentive to come back. Adding game mechanics to your website is often less expensive to implement and run than developing a full-fledged loyalty program. The system is automatic: it runs itself and minimizes administration costs. On top of all that, why give out cash or prizes when most users are happy with virtual rewards? Let’s be honest, some websites are just plain boring. Games, competition and rewards provide an added edge which keep people interested. It’s also good, positive marketing. Most people relate better to companies who aren’t all “business”. Fun and games expose your human side and even create trust. All of these things, traffic growth, increased activity, reduced expenses and improved satisfaction lead to one thing: more revenue. How Can You Introduce Game Mechanics on Your Website? So hopefully I’ve convinced you that there can be some real, tangible value behind game mechanics. The next step is figuring out how you can introduce it on your website. Unfortunately, given the wide range of websites out there, I probably won’t be able to speak to your specific situation, but by providing some examples and techniques, I hope it will at least inspire some new ideas. I also believe that the principles and techniques behind all of the examples can be applied in a variety of ways and be effective on any website. Here are some examples of sites that have some sort of game mechanics for user engagement and community-building. The Problem: Getting web designers and developers to actively provide valuable feedback on other websites. The Solution: Offer points and rank for reviewing, voting and engaging with the site. Concept Feedback is a website review community I developed for web designers and developers. Members can sign up for free and share feedback on other websites, as well as get feedback on their own. In order to create an incentive for members to offer free advice, we started awarding points for various actions. Points can be earned actively by submitting or commenting on a review, voting or completing a profile. 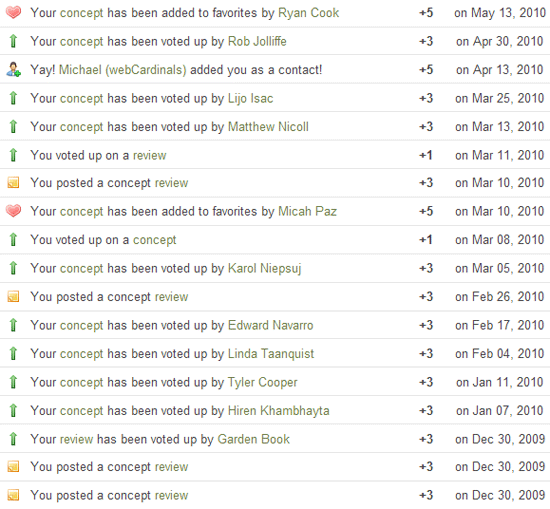 Points can also be earned passively by having others vote up your reviews or add your concept to their favorites. Certain actions are worth more points than others. For example, having someone vote up your review is worth more points than voting up a review on your own. Each activity has a set point value, and we let our users see a running history of their total and how many points each activity contributed to their total score. Once we had a solid point system running, we started ranking each member on a 10-level scale, ranging from “Newbie” to “Elite”. Rank is determined by an algorithm based on a member’s point total and a few other factors. By tagging each member with a rank, users posting a website can better judge which reviews are the most valuable. We’ve found that rank creates an environment of friendly competition that leads to more site activity and reviews. Rank also gives us a tool to filter our best members, not just those who are most active, but the highest quality members, providing a new way for us to monetize our community. 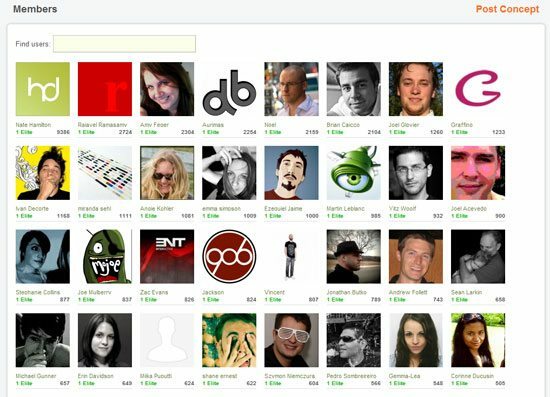 The user page on Concept Feedback displaying top-ranked users. The Problem: Getting programmers to quickly answer programming-related questions posted by other users. The Solution: Award virtual badges for desired behaviors. Stack Overflow (which I admit, was a big influence behind Concept Feedback), a question and answer website for programmers, has implemented an excellent game mechanics system. Like Concept Feedback, Stack Overflow awards points (called “reputation”) to members for participating. How their system works, including which activities earn how many points, is broken down nicely in their FAQ. Stack Overflow has put a number of rules in place to ensure people are not abusing the system, which is run by the users and based entirely on trust (similar to Wikipedia). 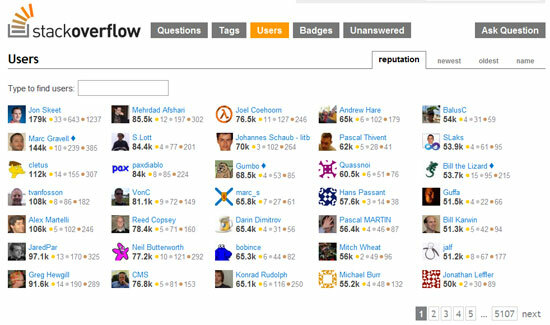 The reputation system allows Stack Overflow to be self-sustaining and self-moderated. 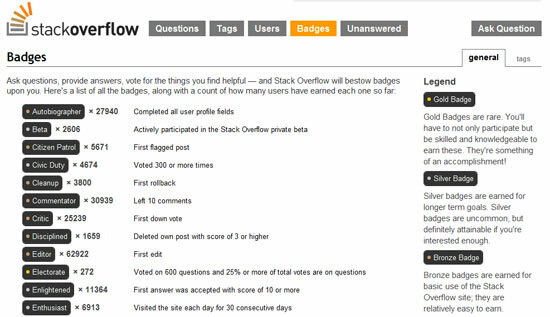 In addition to the reputation system, Stack Overflow awards badges. Badges are awarded for specific actions such as the “Fanatic” badge for visiting the site each day for 100 consecutive days. Each badge is categorized as gold, silver or bronze, with gold badges being the most difficult to earn. Explanation of how to attain a certain badge on Stack Overflow, including number of badges awarded. Many Stack Overflow users have thousands of reputation points and hundreds of badges, and with well over 1 million unique visitors each month, they must be doing something right. Top users on Stack Overflow. The Problem: Getting users to try the software and share it with friends. The Solution: Offer additional storage space for finishing certain tasks. 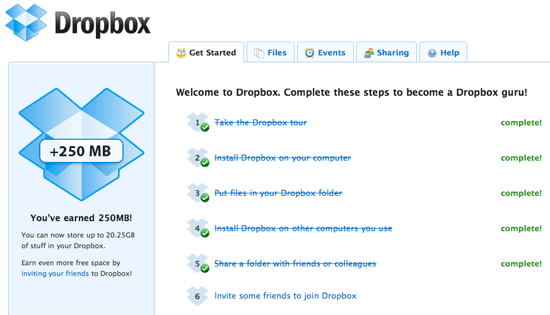 Dropbox — software for syncing your files online and across multiple computers — uses game mechanics to encourage users to try their product and share it with friends. By completing a checklist of tasks (like uploading a file or completing the product tour), users are given additional storage space for free. The checklist is easy to understand, fun to use, and for those of you who are type-A (like me), impossible not to complete. A checklist of tasks on Dropbox that awards you more space upon completion. For web applications, this model is a great way to encourage product use and word of mouth without being overbearing. By offering an incentive, a fair value exchange (you finish these tasks, we give you free storage) is created, which makes people more likely to participate. The Problem: Getting consumers to provide in-depth, interesting reviews on local businesses. The Solution: Creating a status symbol to encourage participation and brand evangelism. Yelp, for those of you not familiar, is a business review community with millions of users and reviews. Each member has a profile, which includes the number of reviews posted, how many “friends” you have, how many times you’ve been the first to review a business and whether your reviews are funny, useful or cool, among other things. Every activity is tracked with the intention of creating a more integrated and personal community. The essence of Yelp! is in its community and in providing easy ways to engage with others on the site is what keeps people engaged and active. Without some kind of interaction, most reviewers would lose interest. Example of a user profile on Yelp!. To take it a step further, Yelp! capitalized on its most dedicated users by allowing them to apply for the Yelp! Elite Squad. This is not much more than an extra profile icon, but it creates a passionate group of brand evangelists who not only provide excellent reviews (for free! ), but tell others about your service and how great it is. Yelp! has successfully been able to leverage status to act as an engine for generating more content and encouraging word of mouth. Hopefully you’ve been inspired by one of these examples to try using game mechanics on your own website. If you still haven’t found something that applies to your specific situation, check out some of the websites below. Each site incorporates some aspect of game mechanics. Is there a website you love that uses game mechanics well (there are plenty more), or perhaps something you’ve been doing on your own website to encourage participation? Please share it in the comments below!